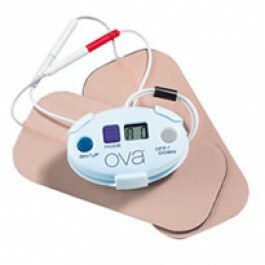 Ova is a pocket-sized device that consists of two self-adhesive electrode pads, which are placed on either side of your stomach. These are connected to a small, push-button control unit. By sending electrical impulses – called TENS – through your skin, the Ova attacks pain in two ways. Firstly, it stimulates the release of endorphins, your body’s own natural pain-relievers. And second, it stimulates the fibres, blocking out pain messages before they reach the pain.